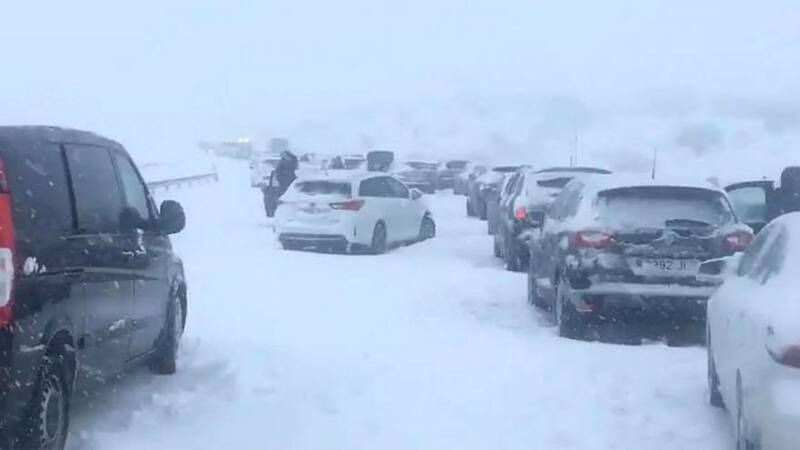 Thousands of people spent the night trapped without moving in their cars after heavy snow forced a motorway to close down in Spain’s Castile and Leon region on Saturday (January 6). Spain’s El Pais reported that between 3,500 and 4,000 cars were blocked on the AP-6 motorway to Segovia all Saturday night waiting for snow blowers to clear the way. On Sunday morning, around a thousand vehicles remained trapped in the motorway said Spain’s Directorate-General of Traffic (DGT). Drivers took to social media to complain about the lack of communication from authorities. Some said they "had been stuck for more than 12 hours without any help or explanation". "It's 8:30 a.m [on Sunday January 7] and we've been here since 7 p.m [on Saturday January 6]. Nobody's come, there are metres and metres of snow. We are completely trapped without knowing what's going on. It's complete chaos," said Twitter user @PaulaPgr in a video. Spanish journalist Eugenia Marcos tweeted that the snow was too deep to drive through. Around 9 a.m on Sunday, some people started saying they could finally see the army shoveling snow out of the way. "Reinforcements have come," said Juanse R Perez on Twitter. The Military Emergencies Unit (UME) was deployed to help clear AP-6, which runs from Madrid to Spain’s northwestern region of Galicia.